Five reasons to attend “How Do You Want To Be Remembered?” – Independence Through Connections. Can you believe it’s almost the end of January? But that’s exciting news for us at SAIL because it means we’re getting closer to jumping into our SAILing Into The Future program. Using experienced faculty, we’re exploring the things that may come up for older adults, how to think about aging and all the good things that come with it, and what’s next! Our first workshop of the year features Karen Rose Gredler and is called “How Would You Like To Be Remembered?” Here are five great reasons for older adults to sign up for that workshop! 1) The instructor is AWESOME. Karen Rose Gredler is one smart lady. She’s got Master’s Degrees in Psychology, Marriage and Family Therapy, and Social Work. What a perfect person to help you articulate who you want to be and how you want to be remembered! She does workshops like this all the time and we are so lucky to have her share her knowledge with us. 2) It’s not a lecture. You won’t just be sitting and listening to Karen. She’ll be working with you to help you do lots of reflection and ask some great questions. When you leave, you’ll have ideas and inspirations that are specific to your life and goals. 3) There are great and important questions that we should all be asking ourselves. Great questions-but hard ones. Samples include: “What is a legacy, and why might we care about leaving one?” and “Why spend time on my legacy now?” The great new musical Hamilton has a fantastic quote about a legacy. “What is a legacy? It’s planting seeds in a garden you may not see.” What seeds do you want to plant? Karen will help you figure it out. 4) You’ll get to interact with other SAIL members and friends. Part of this workshop is talking with others, verbally processing your ideas. You’ll have an opportunity to chat with people and even get ideas about your own life. Maybe you’ll get to know current friends better, or maybe you’ll make a new friend. 5) You get food and materials! A light lunch will be served, and as mentioned above, you’ll have lots of things to take home with you. Who can resist snacks? “How Do You Want To Be Remembered?” will take place on Wednesday, February 6th at Oakwood’s Heritage Oaks in the Nakoma/Westmorland Room. Cost is $10 for Full SAIL members, $20 for Associate members, and $30 for non-members. 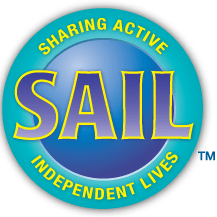 We strongly encourage you to bring a friend to learn about what SAIL has to offer. If they want to join, they can apply their workshop fee toward their membership, and you get a $25 gift card! Register online here or call us at 230-4321. ‹ PreviousWays to keep your mind sharp! Next ›February Read: Turns out Seniors are the tech gurus!